The Church at Pergamum Revelation 2:12-17. 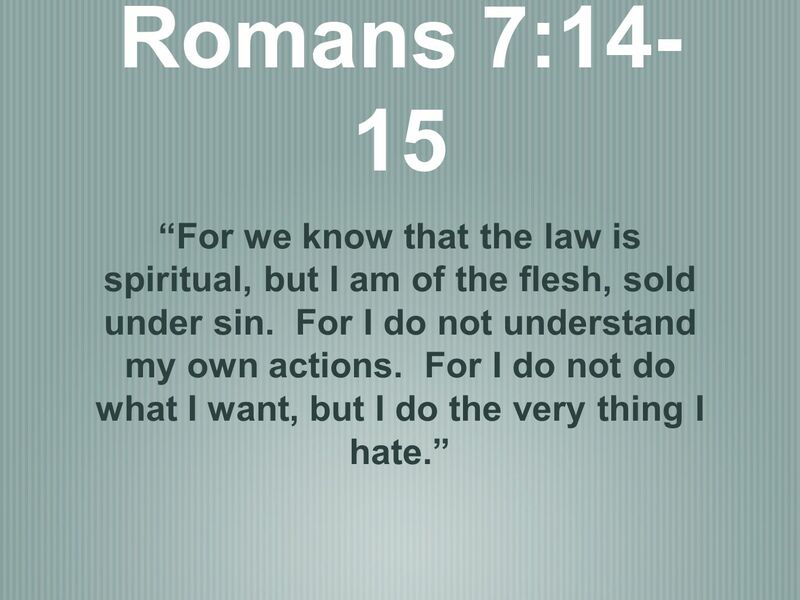 Romans 7:14- 15 For we know that the law is spiritual, but I am of the flesh, sold under sin. For I do not. 2 Romans 7:14- 15 For we know that the law is spiritual, but I am of the flesh, sold under sin. For I do not understand my own actions. For I do not do what I want, but I do the very thing I hate. 3 Revelation 2:12- 17 And to the angel of the church in Pergamum write: The words of him who has the sharp two-edged sword. I know where you dwell, where Satan's throne is. Yet you hold fast my name, and you did not deny my faith even in the days of Antipas my faithful witness, who was killed among you, where Satan dwells. 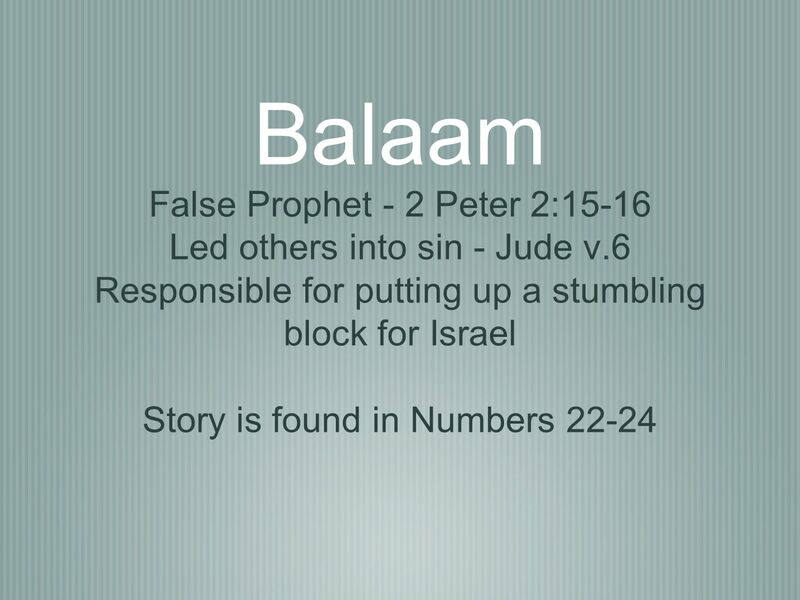 But I have a few things against you: you have some there who hold the teaching of Balaam, who taught Balak to put a stumbling block before the sons of Israel, so that they might eat food sacrificed to idols and practice sexual immorality. 4 So also you have some who hold the teaching of the Nicolaitans. 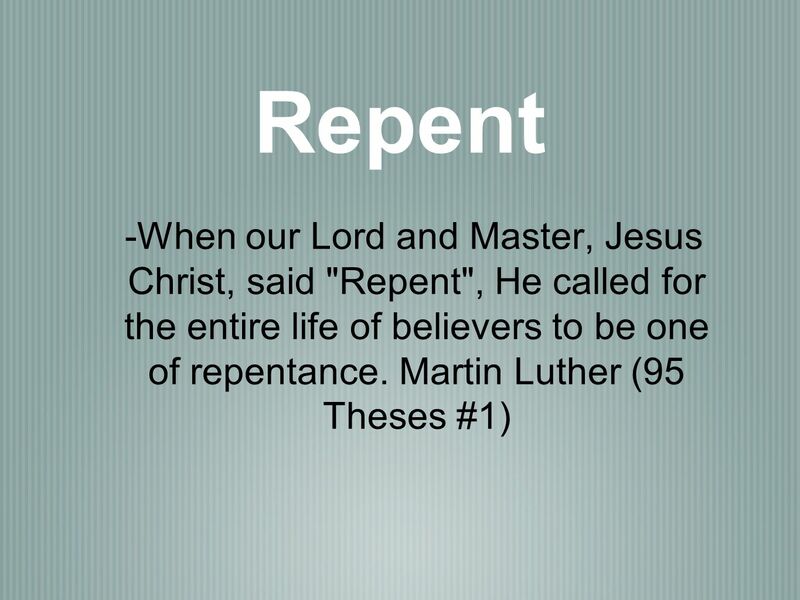 Therefore repent. If not, I will come to you soon and war against them with the sword of my mouth. He who has an ear, let him hear what the Spirit says to the churches. 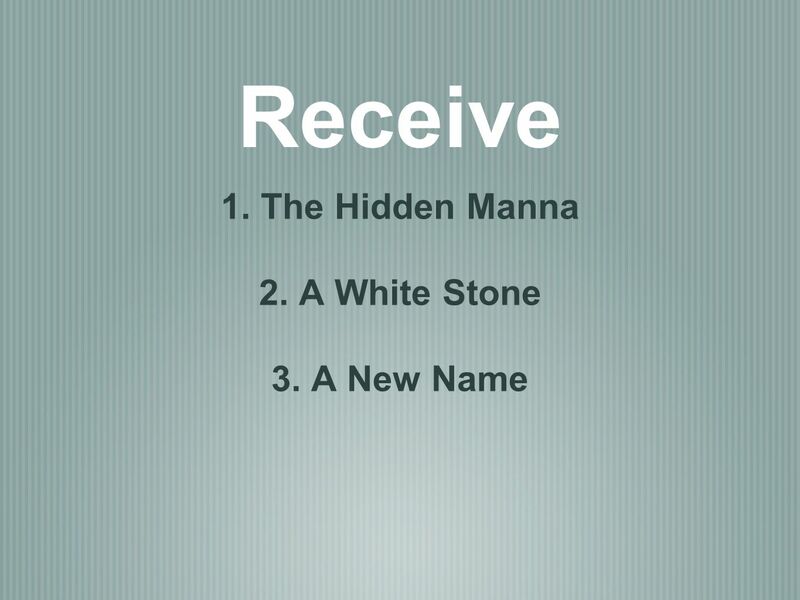 To the one who conquers I will give some of the hidden manna, and I will give him a white stone, with a new name written on the stone that no one knows except the one who receives it. 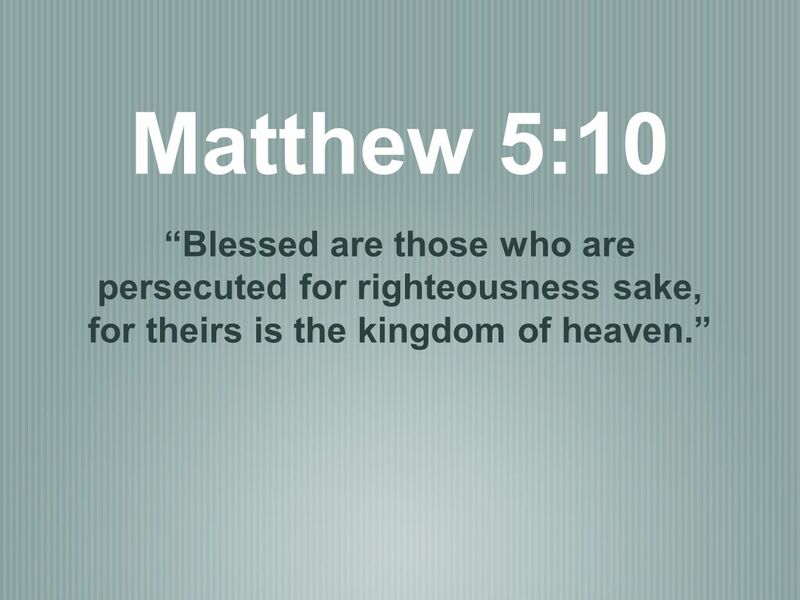 6 Matthew 5:10 Blessed are those who are persecuted for righteousness sake, for theirs is the kingdom of heaven. 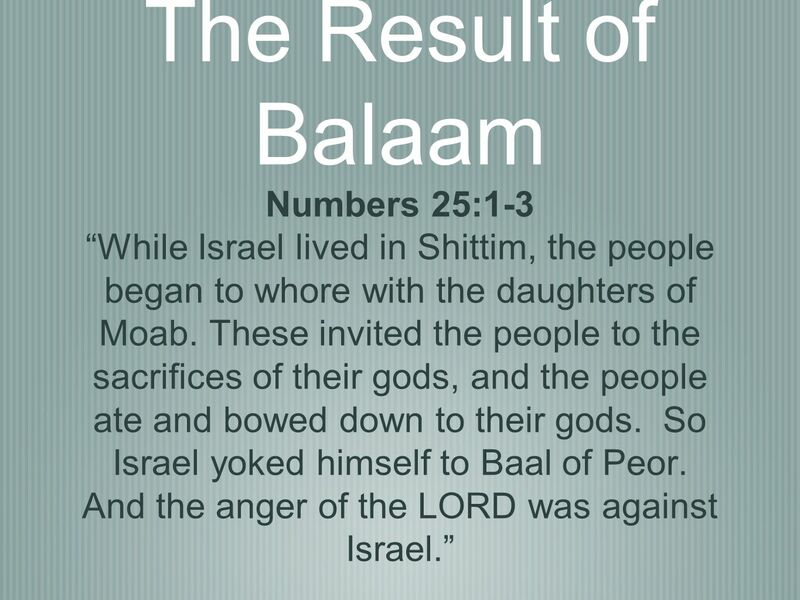 8 The Result of Balaam Numbers 25:1-3 While Israel lived in Shittim, the people began to whore with the daughters of Moab. These invited the people to the sacrifices of their gods, and the people ate and bowed down to their gods. So Israel yoked himself to Baal of Peor. And the anger of the LORD was against Israel. 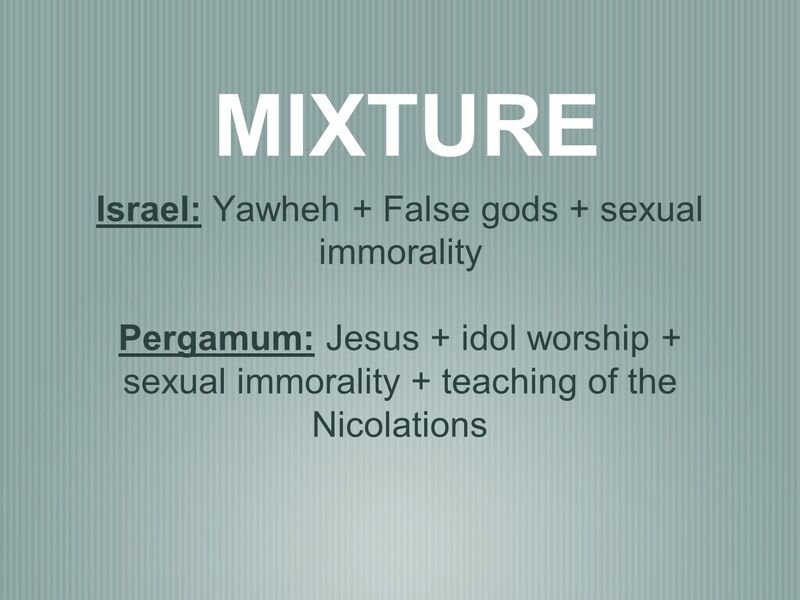 10 MIXTURE US JESUS + ? 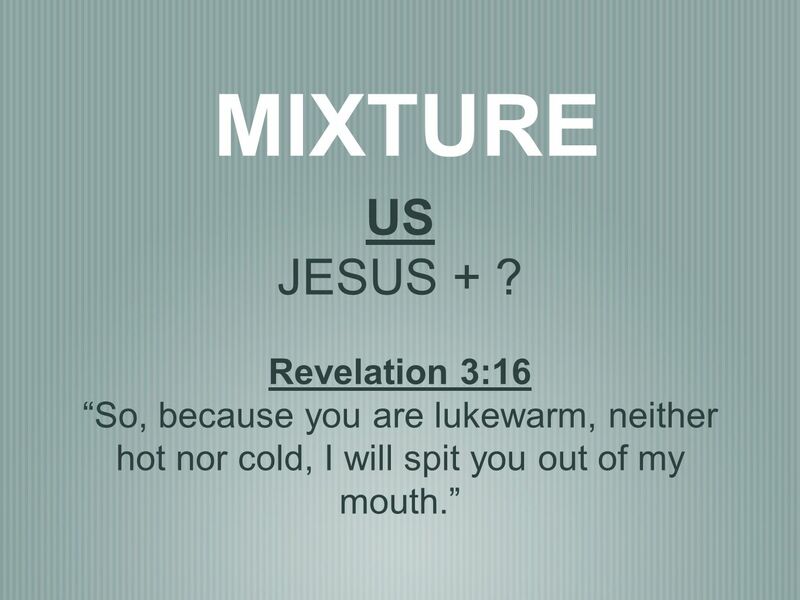 Revelation 3:16 So, because you are lukewarm, neither hot nor cold, I will spit you out of my mouth. 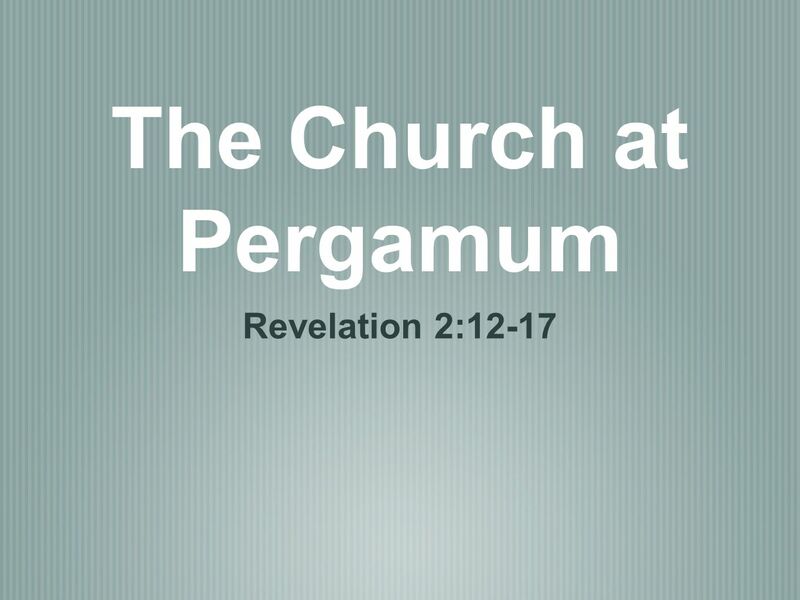 Download ppt "The Church at Pergamum Revelation 2:12-17. Romans 7:14- 15 For we know that the law is spiritual, but I am of the flesh, sold under sin. For I do not." Letters To Seven Church of Asia (Rev. 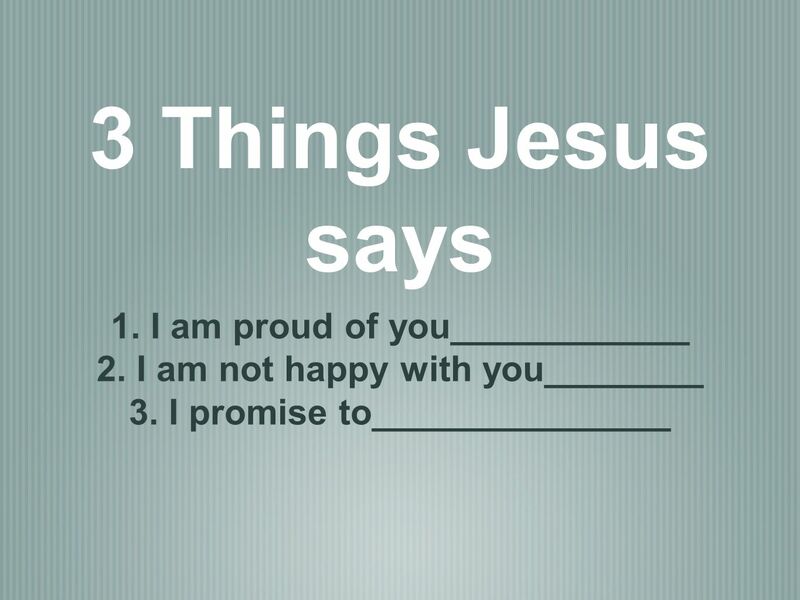 2-3) Some were good (Smyrna, Philadelphia) Some were good / bad (Ephesus, Pergomas, Thyatira, Sardis) One was bad. Shema in pursuit of a fully integrated Scripture seeking to walk out our faith in the footsteps of the Anointed One. 1 John 4 1. Beloved, believe not every spirit, but try the spirits whether they are of God: because many false prophets are gone out into the world. 6. Seven Letters to Seven Churches Ephesus– Abandoned Their 1 st Love Revelation 2:1-7 July 11, 2010.  Rev 2:12-17 –And to the angel of the church in Pergamum write:  The One who has the sharp two-edged sword says this:  'I know where you dwell, where. 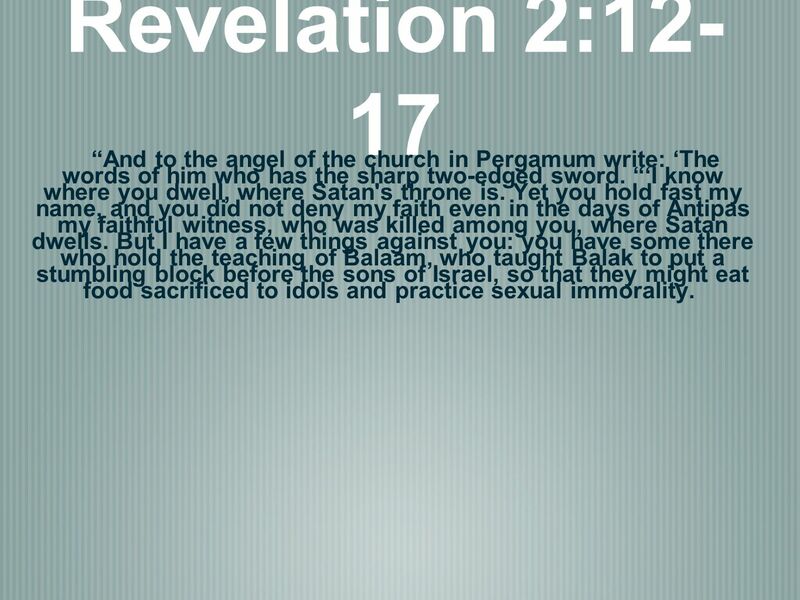 Revelation 2:12-17 Pergamos the Seat of Satan The Altar of Zeus. Pergamum is one of the seven churches in Turkey. To the angel of the church in Pergamum write: These are the words of him who has. WE ARE TO BE A CHURCH THAT LIVES BY GOD’S STANDARDS. Thyatira—The “Tolerant” Church Rev. 2: He who has an ear, let him hear what the Spirit says to the churches. To him who overcomes I will give. Pergamum: Hold the Truth Revelation 2: Pergamum Hold the Truth Rev. 2:12-17 Impressive architecture and history! Altars to many gods and emperors. Seven Churches of Asia Revelation Chapters 2 and 3. 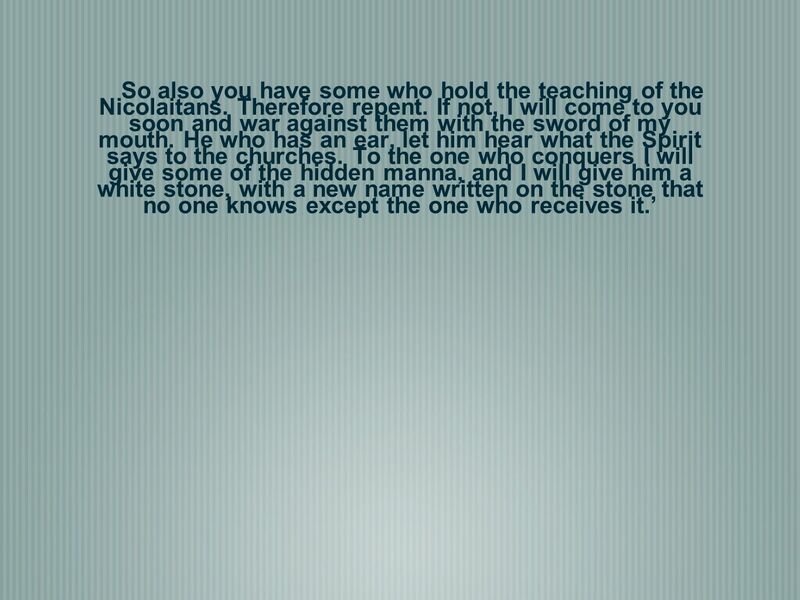 The Letter to the church at Pergamos Revelation 2:12-17. Pergamos Revelation 2:12-17 Pergamos 50 miles N/NE. of Smyrna the official capital of Asia Minor “the most illustrious city in Asia” housed a library.